A first time event sponsored by The Cape Town Market was held at the Wine Estate of Org de Rac, situated in the rolling Piketberg hills to acknowledge the Sandveld potato producers, the buyer, the consumer and of course THE POTATO. Terence Brown of Potato South Africa hosted an interesting and varied programme for the event, the “Potato Art” competition with some spectacular sculptures by children from Middeldeur Vlei Primary School, one particular creation was Mr Potatoman with mass of porcupine quills for hair. The Hoerskool Piketberg had a potato challenge cook off at their school, where dishes ranged from potato ice-cream to a potato cake. Joost Engelbrecht, Chairman of the Sandveld Producers Organisation (SAKO), enthused about the region’s environmental bio-diversity. He highlighted that the various cultivars of potatoes were classified due to the regions dominance in the Potato Industry with reference to the quality of produce, all year round production and of course the calibre of the farmer. He also noted that the region is the National holder of both the previous and current Potato Farmer of the Year Awards. 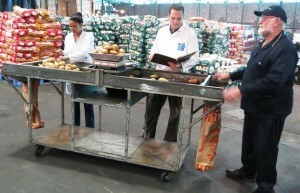 Rob Lowe, CEO of the Cape Town Market, introduced the market with a brief history and working process of a commission markets before amusing visitors with a comparisson of rice and pasta as opposed to the wonderful nutritional and even medicinal values for the POTATO. We were told a potato would help with a hangover, perhaps in preparation for the wine tasting that was offered later? The Womans Institute, Piketberg Vroue- landbouvereniging (VLV), which had partnered with Potato South Africa a few years ago demonstrated the joint initiative has blossomed to a point where the VLV has empowered women in computer literacy, from just a handful to over two thousand enlightened women. They also mobilized domestic workers, in the region, to establish a “proudly women” organization, with one of their many projects will be assisting their constituency in skills development. The Cape Town Market agents represented at this auspicious event were Maine Daniels, Nassier Ebrahim and JP Mostert from RSA Neil Schrueder from Boland and Willem Nel and Deon Van Rensburgfrom Fine Brothers who added to the prize money of the Potato Artwork competition. Fox and Brink also very generously supplied all the guests with a 4kg bag of potatoes with was part of a goodie bag that also had in it cookbooks, postcards and plenty of useful information. The Cape Town Market wishes to thank Potatoes South African and Terence Brown for a well organised and thoroughly entertaining event as well as the speakers for their insights into this valuable industry. Ivan Venter, younger brother of Jaco Venter (3rd place Argus 2012) has won the Engen Dynamic Cycle Challenge that took place in Wellington on Sunday 7th October 2012. 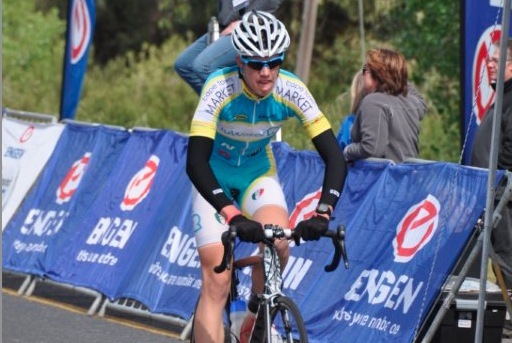 Ivan is still competing in the under 16 category but is widely considered to be the future of South African cycling. Ivan is proudly sponsored by Nuwater and The Cape Town Market, both Altius Investment Holding Companies. The cycling team has won numerous races and are often placed in the top 10, the Nuwater/Cape Town Market Team has become a familiar name in the cycling fraternity and with cyclists such as Ivan the team is sure to continue its great performance. There have been many problems related to marking requirements and especially the net mass of potatoes that have occurred in the last few months. It is expected that Prokon, as official assignee of the Department of Agriculture, Forestry and Fisheries (DAFF), is required to enforce the regulations correctly according to the Potato regulation No. 33735 of 12 Nov. 2010. Sub reg. 3(1) about marking requirements and especially 3 (1) h read together with 8 (6) “misleading information”, where the net weight differs from the mass as indicated on the container. Where a problem is found with the above, the consignment with the necessary instruction document will be temporarily stopped. Sufficient time will be provided in order for the necessary corrections to be made. After the quality controller has verified that the correction has been made, then the product will be permitted for sale and removal.